This edition: Mountain Dew, which is made from 13 separate ingredients that we’ve broken down in the exact order they appear on their website. 2) High Fructose Corn Syrup: High fructose corn syrup is corn syrup that’s had some of its glucose converted to fructose enzymatically. It’s a commonly-used sweetener, and has been linked to obesity and diabetes by many, many studies. So, if possible, you want to avoid foods and drinks containing this ingredient. The honey-like texture of high fructose corn syrup may also contribute to the dewy consistency of Mountain Dew — a 20-ounce bottle of the stuff boasts a whopping 77 grams of sugar (19 teaspoons! ), most of which comes from the gobs of high fructose corn syrup dispensed into each serving (for reference, a 16-ounce Starbucks Mocha Frappuccino contains 61 grams of sugar). 3) Concentrated Orange Juice: Concentrated orange juice has been filtered through a processor that extracts all of the excess water — that way, the juice takes up less space while being transported. This also yields a product that’s seven times more concentrated than the initial juice. 4) Citric Acid: Citric acid is a sour flavoring agent derived from citrus, and it’s often used to keep products like Mountain Dew fresh while they’re sitting on the shelves. 5) Natural Flavor: Natural flavors are quite literally flavors derived from an actual food source — i.e., orange flavoring taken from a real orange. 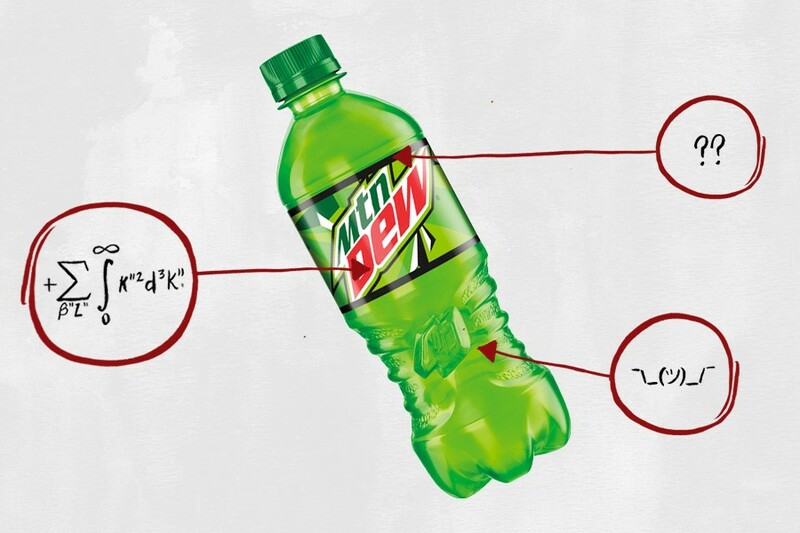 Which natural flavors are used to make Mountain Dew remains a mystery since the FDA allows companies to protect their recipes by using vague terminology like “spices” or “natural flavors” when referring to flavoring agents. 6) Sodium Benzoate: Acting as a preservative, studies show that sodium benzoate may exacerbate hyperactive behavior in young children, which is probably reason enough to keep their hands off of this stuff. 7) Caffeine: Reports on the negative effects of caffeine are strewn across the web, including addiction, insomnia and irritability. But as physician and biochemist Cate Shanahan, author of Deep Nutrition: Why Your Genes Need Traditional Food, told us during our exploration of the ingredients found in Diet Coke, “Caffeine helps burn fat.” It does this by stimulating a process called thermogenesis, which converts calories into heat energy (and explains why you might start sweating after drinking a little too much coffee). A 2005 study even found that higher-dose caffeine consumers experienced a greater decrease in fat mass, body weight and waist circumference than their less caffeinated counterparts. But then again, Mountain Dew really isn’t the healthiest means of upping your caffeine intake. 8) Sodium Citrate: Sodium citrate is the sodium salt of citric acid, according to Dagan Xavier, ingredient expert and co-founder of Label Insight. It acts as a preservative and can provide a sour taste when added in high amounts. 9) Erythorbic Acid: “Erythorbic acid is a compound that can be naturally derived from many fruits and vegetables,” Xavier explains. “It’s commonly used as an antioxidant or preservative.” Studies also show that erythorbic acid enhances iron absorption, which is an unexpected plus. 10) Gum Arabic: According to Xavier, gum arabic is derived from the Acacia Senegal plant — a large genus of shrubs, lianas and trees. The secretions from these plants are typically turned into a gum, which can be used as a bulking agent, emulsifier, stabilizer, thickener, foaming agent, gelling agent, suspending agent and whipping agent (like high fructose corn syrup, gum arabic may also contribute to the slightly syrupy texture of Mountain Dew). In the case of Mountain Dew, gum arabic is probably used as an emulsifier and a stabilizer — in simpler terms, it helps all of the ingredients properly blend together. 11) Calcium Disodium EDTA: Another preservative, calcium disodium EDTA “binds to metals like iron, which slows the rate of oxidation, and thus, the development of rancid aromas,” Gavin Lavi Sacks, associate professor and academic director of Cornell University’s Food Science & Technology at Geneva Program, told us during our exploration of the many ingredients in McDonald’s Big Mac. Because it binds to metals, studies performed on animals have shown that sustained consumption of calcium disodium EDTA can cause essential mineral depletion. As for what it does to people, human studies are still required to come to a real conclusion on whether or not we should be worried about this ingredient. 12) Brominated Vegetable Oil: “Brominated vegetable oil is a mixture of plant-derived triglycerides that have been treated with bromine in order to help emulsify citrus-flavored soft drinks,” Xavier explains. “This prevents the citrus flavor from separating out.” Soda fanatics should watch out for this ingredient, though: Excessive consumption of brominated vegetable oil may lead to bromism, a condition that causes mental dullness and muscular weakness (make your own obsessive gamer joke here). 13) Yellow 5: Similar to artificial flavors, artificial colors are created in a lab by chemists. Unfortunately, they’re known to be cancerous: “Because color molecules are a similar shape to some of our DNA structures, they’re able to make their way in there and cause issues,” Shanahan explained to us during our exploration of the ingredients in Candy Corn. “That said, I’ve always been of the opinion that studies claiming artificial colors can cause cancer are irrelevant because [in the studies] they use really high amounts of the artificial colors — like, a million times more than you’d ever get [in your] food [throughout your lifetime].” So the average person’s liver should be able to break down whatever miniscule amount of artificial coloring we consume with food. If drinking too much soda is bad for you, drinking too much Mountain Dew is a death sentence. High fructose corn syrup will give you diabetes, sodium benzoate will turn you into a tweaker and brominated vegetable oil will devour your soul. So rather than doing the Dew, just don’t.